The budding South Broad Ripple neighborhood—SoBro—has a welcome new neighbor in Kimbal Musk, who has officially launched his second restaurant in Indy, Next Door American Eatery, now open, at 46th and College Ave in the previously vacant Double 8 Foods building. This affordable farm-to-table restaurant focuses largely on local and sustainable ingredients. Though the bulk of the menu trends on the healthier side, with bowls and salads taking center stage, some of my favorite bites were some of the more indulgent options. The deep fried Calamari Fritto Misto is sinfully good. Lovely bits of fried calamari, zucchini, and pepperoncini are served crisp and golden, seasoned with just the right amount of lemon juice. A side of spicy, house sriracha aioli is a welcome accompaniment to this shareable that’s enjoyable enough to order as an entrée. Like the Fritto Misto, the majority of the long list of appetizers at Next Door, dubbed “Snack & Share” on the menu, are worth an order. 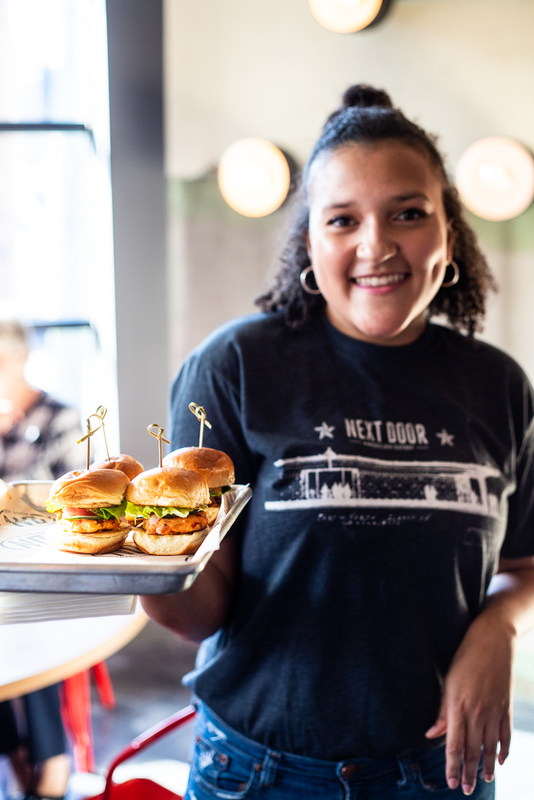 Fresh, flavorful, and often fried, appetizers like the loaded smashers (think loaded fries subbed with crisp and tender smashed potatoes), fried kale chips, and buffalo chicken bites are must-haves at the new eatery. As is to be expected during the first few weeks of service at any new restaurant, there were a couple of stumbles. During my early visits to the causal farm-to-table newcomer, a few of the entrees I sampled did not quite live up to their potential, often suffering from being just under-seasoned or unevenly prepared. The salmon bowl with its quinoa salad with roasted beets and kale was beckoning for a touch more salt. The salmon, just overcooked, was heavy-handedly spritzed with enough added lemon juice to overpower the subtle taste of the fish. 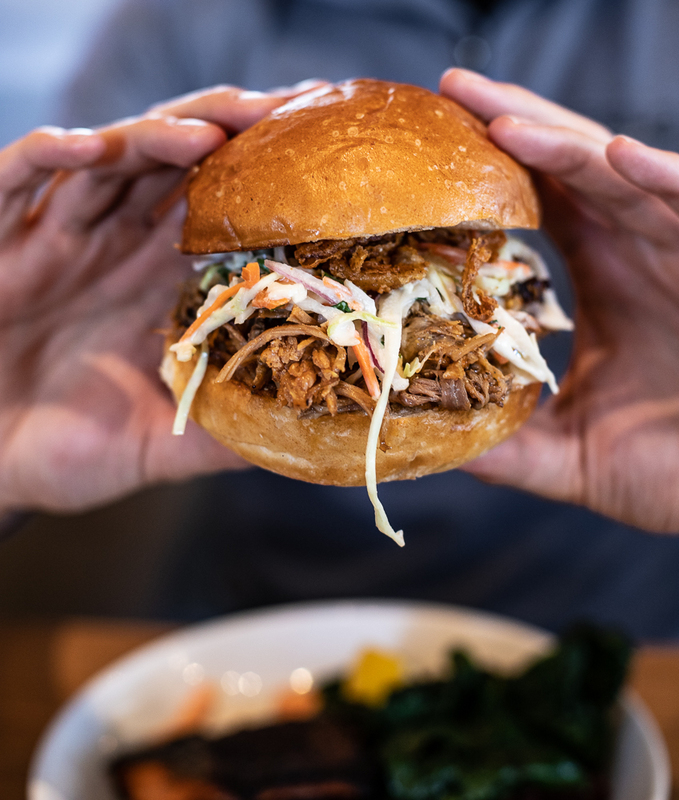 Pictured Above: Merlin's Carolina Pork with mustard BBQ, cole slaw, crispy onions & house pickles is another not-to-be missed item. These blunders are hardly unforgiveable. Every new kitchen needs time to find its groove, and although I was somewhat underwhelmed by a couple of the entrees at Next Door, I remained impressed by the overall experience. Service is phenomenal; the wait staff is knowledgeable and incredibly friendly. The space is open and relaxed, complete with one of the best new patios in the city. Grab your friends, a beer (or a cocktail, if that’s your thing—they are also fantastic), and a seat at the patio. Order some apps (I can’t recommend the Fritto Misto enough! ), and enjoy this magnificent new addition to the ever-growing Indy food scene.